Canadian Pacific Holiday Train is Rolling into Wisconsin! The return of the Canadian Pacific Holiday Train is HERE! 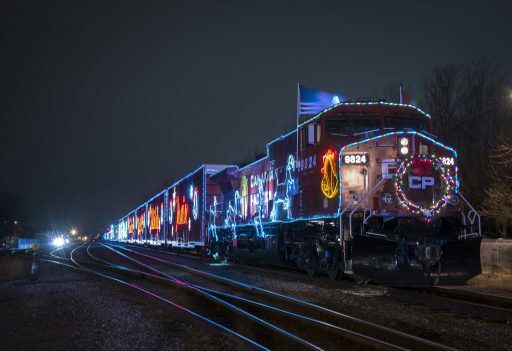 We love following the state’s highways, but heading into the holiday season we love to follow the rails when the festive and fun Canadian Pacific Holiday Train delights thousands in Wisconsin on its journey across North America! Amazing, colorful lights and live entertainment visit town after town along the CP tracks from Sturtevant to La Crosse as part of its long trek across Canada and the northern U.S., helping local food banks along the way. The CP Holiday Train consists of two trains running across North America, with one staying in Canada and one coming into the United States. The U.S.-bound train departed from Montreal November 25 and headed south. As the train arrives in Chicago, The Trews and Willy Porter hop on board for the ride through Illinois, Iowa, Missouri, Wisconsin, Minnesota and North Dakota before arriving at their final destination in Weyburn, Sask. on December 16th. The Canadian Pacific Holiday Train will ride the Canadian Pacific tracks into the state from Illinois on Thursday, December 6th, following the same route the Amtrak Empire Builder uses to Milwaukee and then west-northwest to La Crosse through Monday. The train is loaded with colorful lights and displays along its entire route, dazzling everyone who witnesses its passing. During each half-hour stop, The Trews and Willy Porter will give free performances. Food or cash donations will also be collected to benefit the community at each stop. 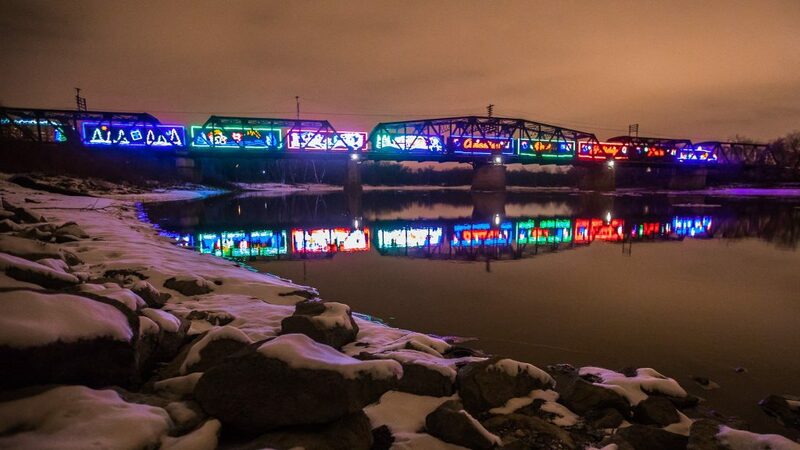 The Canadian Pacific Holiday Train crossing a river. See why it’s so eye-catching?? By the way, from Hartland to La Crosse, Highway 16 is a GREAT parallel to the Canadian Pacific route! Get more details, including arrival times, on our Event page for the Canadian Pacific Holiday Train!